AT TEN minutes to eleven on the morning of Friday, January 21, 1910, almost the very hour at which on another January 21 Louis XVI. mounted the scaffold, the power station from which all the public clocks of Paris are worked by compressed air was flooded by the Seine; all the clocks stopped simultaneously with military exactitude, and with a start of surprise Parisians began to realize that the Seine in flood was not a harmless spectacle that could be watched with the cheerful calm of philosophic detachment, and that the river in revolt was an enemy to be feared even by the most civilized city in Europe. Crowds, it is true, had gathered on the embankments, admiring the headlong rush of the silent yellow river that carried with it logs and barrels, broken furniture, the carcasses of animals, and perhaps sometimes a corpse, all racing madly to the sea; they had watched cranes, great piles of stones, and the roofs of sheds emerge for a time from the flooded wharves and then vanish in the swirl of the rising water, while barges and pontoons, generally hidden from sight far below, rose gradually above the level of the streets, notably one great two-storied bathing barge, a vision of unsuspected hideousness, that threatened at any moment, triply moored as it was, to crash into the parapet. But it was in the order of things that wharves should be flooded; it was sad that the little suburban towns by the river should be swamped, but these incidents could be regarded with altruistic sympathy. The stopping of clocks, however, and the irritating obsession of onze heures moins dix which confronted the Parisian from every street and cafe clock was something new and alarming; with its suggestion that time had stopped dead at the most ill-chosen of moments, this petty but perpetually repeated annoyance was the symbol of all the manifold inconveniences wrought by the flood, the failure of electric light, the disorganization of trams and ‘buses, the bursting of drains and the swamping of houses, and perhaps none of them was more demoralizing. By the time that Paris woke up to the fact that it was war with water, the most evasive and insidious of enemies, the Seine had made the low-lying suburbs its own. From visits to out-lying districts I retain a vague impression of thick black slime, abject shivering misery and great lakes of yellow water, with here and there the upper story of a house rising like an island from the desolate waste. From the Ile de la Grande Jatte, where the little restaurants were six feet deep in water, I watched a rescue party row back with difficulty across the river. They had saved a few pathetic sticks of furniture and a great mattress which, as its owner with exultation pointed out to the sympathetic crowd, was perfectly dry. A covered cart was in waiting, but the inside was already full and the mattress was hoisted on to the roof. Alas! for the vanity of human exultation! Hardly had it been tied in place when a storm of torrential rain swept down and drenched the mattress and its poor despairing owner as thoroughly as though they had fallen in the Seine. All the time the Seine was rising remorselessly, and those whose houses were threatened gathered along the banks in the rain, watching the river with the silence of utter dejection, though some of the braver spirits were building walls of masonry across their thresholds— walls over which a few hours later the river had risen. At Bercy, within the fortifications, the quay was under water. The scene was indescribably desolate: a long row of cheerless houses three feet deep in water, as far as the eye could see; a double row of lighted gas-lamps burning pale and absurd in the gray daylight, because the flood had made it impossible to extinguish them; a punt conveying a workman to his flooded home, poled slowly along by two policemen and bumping monotonously against the poplars and sunken railings; two soldiers on a flimsy raft that the most destitute of mariners would have scorned, steering an erratic course, as one of them paddled desperately with a tin pan; and only one bright touch. From the sixth story of one of the beleaguered houses a scarlet duster shaken by same careful housewife waved defiance to the river. A day or two later the Seine was working havoc. havoc in the very heart of the city. On the left bank the defenses were weakened by the low level railway lines running from the great Orleans terminus of the Quai d’Orsay to the Austerlitz Station and from the Esplanade des Invalides to the Auteuil viaduct. The whole length of these lines was flooded twenty feet deep. The Seine actually flowed through the Orsay terminus as the water poured on to the line higher up the river and then fell back into the Seine through the ventilation shafts of the station, which looked for all the world like a swimming bath. Only the iron gallery, on a level with the entrance from the road, was left unsubmerged; the central depth had been converted into a huge tank of muddy water, while the sightseer looked vainly for the engines and carriages that lay drowned beneath. The unfinished works of the Metropolitan railway, running from north to south, had been converted into a subterranean river at right angles to the Seine two miles long, and were flooding squares and streets a mile away near the Saint Lazare Station. On the right bank the river was threatened to overflow the embankments, and the problem of defense became a difficult one; for the damage done by the inundation of the Saint Germain quarter by the water from the Orsay Station, and of many streets in the central districts by percolation, would have been nothing to the havoc that would have been wrought by the direct sweep of the Seine over the embankments on the right bank. One of the difficulties of the situation was the Pont de I’Alma, which, with its low arches, was almost submerged, and held back in the center of Paris great masses of water that threatened to sweep over the quays. Up the Seine on the right bank men were working for dear life by the light of naphtha flares to raise the earthworks along the parapet of the embankment. 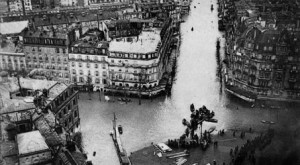 The Quai de la Conference and the fashionable avenue of Cours la Reine were deep in water, but a thin line of sandbags backed here and there by wooden screens still kept back the surface flood. As the river rose, and it rose eventually over five The seine feet above the level of the embankment, the military engineers raised the height of the barrier, which was half a mile long. That night the water was steadily creeping higher and higher, while a civil engineer, mud-bespattered, with the red ribbon of the Legion of Honor in his button-hole, was standing on the corner of the sandbag bastion by the Pont de la Concorde and measuring its advance. He turned to a stranger beside him and said: “The river is still rising as fast as ever. If the barrier goes, five feet of water will sweep across the Place de la Concorde, the Boulevards—over everywhere,” he added with an expressive gesture, “until it meets the flood that the Metropolitan is pouring out round the Saint Lazare Station.” Then abruptly he turned to a non-commissioned officer awaiting orders behind him: “Give me another tier of sandbags.” Orders were hoarsely shouted, and a crowd of little black figures, each shouldering a sandbag, swarmed like ants along the narrow earthwork, on the one side a few inches above the river, on the other a foot or so above the flood that lay deep on the embankment and on the avenue of Cours la Reine. Weary as they were, after three days’ unceasing toil, each man swung his sandbag into its place with a will and burst into a soldiers’ chorus that sounded strangely merry amid the desolation around. That night the Quai du Louvre was barred off by the police, and a silent crowd gathered at the barrier, though nothing could be seen, anxious for the safety of the collections that are the pride of France. In the mist the Seine seemed as broad as the Rhine at Cologne, and the eye of fancy could descry Notre Dame between two raging floods, splendid and fearless in the majesty of its builders’ faith. At this point the river flows beneath the Pont des Arts, and as its water poured through the iron supports of the bridge it made the little rippling noise of a hundred small cascades, a sound like malicious laughter even more terrible than its silence. The roadway along the southern facade of the Louvre was all uneven with the pressure of the overflowing drains beneath it, as though an earthquake had passed, and it sagged down suddenly just beneath the balcony of the splendid Jean-Goujon door. Here out of sight of the anxious crowd there was a scene of feverish activity. Men were tearing up cobbles from the road and building a rough wall across a gap in the parapet, where a flight of steps goes down to the river. There was need of haste; for the water that looked black and stagnant in the glare of the naphtha flares was creeping up apace and licking the lowest tier of cobbles. Others were recklessly digging great holes in the footpath between the poplars, and ramming the earth into bags, or nailing together great pieces of driftwood, fished from the river, to form a screen behind the sandbags on the parapet and hold them against the pressure of the current, while carts kept rumbling in and unloading piles of stone and rubble against the wall and screen. I glanced over the screen that reached my chin, expecting to see the river five feet or so below me, and drew back with a start of alarm when I saw the gleam of water above the stone parapet and realized that it was only held back by the flimsy barrier. A few hours later and the river would have won; all the basements of the Louvre would have been flooded, and the water would have carried ruin across the Rue de Rivoli and Palais Royal. It was no wonder that a sense of impending disaster hung over Paris; yet there was much in the situation that was simply comic. The special envoys of the King of the Belgians, invited to a lunch at the Foreign Office, were carried there in a large, flat-bottomed boat poled by a couple of watermen. Naval boats of the collapsible Berthon pattern were to be seen on wagons in the Avenue de l’Opera, while bare-footed sailors splashed contentedly in the lake opposite the Saint Lazare Station. At times the incongruity of these things was scarcely realized. Bridge after bridge was closed to the public as great masses of driftwood that could not be dislodged formed against them, until at one moment traffic was forbidden over all the nine bridges that lie between the Pont Neuf and the Pont de Crenelle. Cabs, carts, and every kind of vehicle concentrated in the unflooded streets, were blocked into a solid mass that surpassed the wildest nightmares of congested traffic. Part of the Place de l’Opera began to collapse, and a cab might take two hours to get from the Opera to the Madeleine, five minutes’ walk. An unreasoning panic seized the cabmen and chauffeurs; they were possessed with the fixed idea that no bridge across the Seine was safe, and no bribe would persuade them to cross the river; while they refused to take fares for even the shortest distance. Men left their homes dry-shod in the morning, and returning from business had to wade up to their knees through unlighted streets or creep perilously along a narrow plank gangway, only to find that it stopped short just where the water was deepest. One evening I was walking down a street which a few hours before had been thick with traffic. A single cart passed down beside me, and at once, without the slightest warning, the road began to undulate; and the next minute I was in water up to the knees, and one wheel of the cart had sunk through the wood pavement up to the axle. Once wet I plodded on through the water and in the darkness blundered against a plank which formed part of a trestle bridge some five feet from the ground; then climbing up, found myself at a perilous elevation on two exceedingly narrow planks. After cautiously venturing forward some little way, a woman’s shriek sounded so close to me that I almost lost my balance. Then in the obscurity a long row of black figures was discernible all on the bridge and coming in the opposite direction to myself. I succeeded in helping the young woman who had shrieked to pass me; then an elderly business man slipped between the two planks at my feet, and was hauled up with difficulty; then finally there was a crack, a plank broke and some unfortunate person fell flat on his face in two feet of filthy water. At last, somehow or other, I reached higher ground, and found a pathetic group of men and women, lighted by a policeman’s lantern, waiting to take their turn on the remains of the gangway. They were returning to their homes in the street which had been flooded since they went out. On Saturday, January 29, Paris awoke to a bright sunny morning and the end of its nightmare. Early in the morning crowds gathered along the embankment, no longer murmuring in melancholy chorus, “Qa monte, qa monte” ; but laughing and chattering as they watched with uproarious satisfaction the broadening of the thin dark line which showed that the Seine was no longer rising or stationary, but slowly falling. Sunshine restored, even in the flooded quarters, the true Parisian gaiety that had for a time been overclouded with a terrible sense of powerlessness and insecurity. 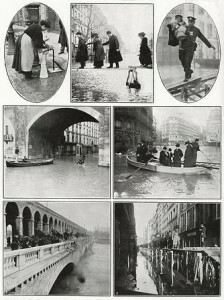 The flooded streets were bright and gay in the sunlight, as boats plied to and fro carrying men and women to their work. Every one was good-humored, and even a portly business man swarming down a rope from a first-story window into a police boat, while his wife and children watched his gymnastic prowess with undisguised horror, was laughing heartily, and fully conscious of the humor of the situation. Throughout the day crowds flocked to all the quarters that the river had attacked. To make the scene more gay, soldiers were everywhere, standing on guard at dangerous points or gathered round fires of wood paving blocks and drinking coffee and hot wine. Every one had an air of triumph; for the Seine had at last confessed itself defeated, and it only remained for Paris to show once again its superiority to disaster. In almost every street between Montmartre and the river pumps were hard at work: encouragement came from the news that the Seine was failing to resume what had been before the hopeless task of emptying cellars and basements; there were pumps of every kind, large and small, hand-pumps, smart electric pumps, steam pumps, and monstrous indescribable pieces of machinery that took up half the roadway, obscured the sunshine with clouds of filthy smoke and looked as if they had been rescued from the scrap-heap. Half Paris was in the streets gaping at the excavations, where the water had entangled planks and masonry, s«j>«o< pipes and cables in inextricable confusion and examining the barricades with eager interest while their elders compared them with the barricades of the Commune. The Knowledge of Water by Sarah Smith (fiction) ****!